What is a Clan War? Clan Wars gives you and your Clan a chance to show the entire game community who rules the battlefields once and for all. 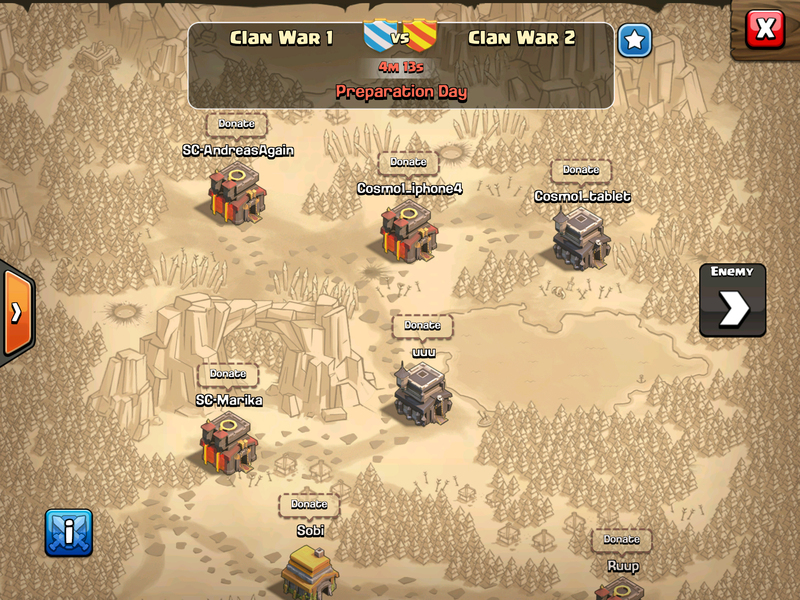 A Clan War is a strategic battle between two Clans of roughly equal strength. Both clans need to have the same amount of participants selected for the Clan War line-up to be matched against eachother. 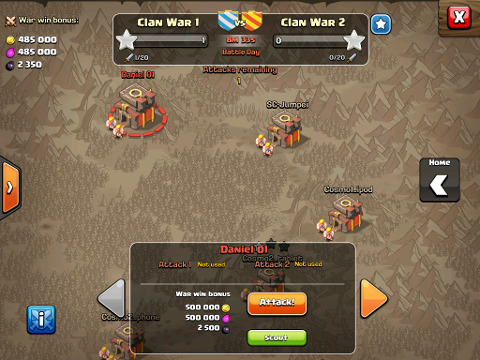 For a player to fight in a war, the "Clan wars" button in his player profile must be green, indicating that he is available for Wars and the Leader must have chosen him for the lineup. The Clan Leader or a Co-Leader initiates the search for a Clan War opponent. Once an opponent has been found, you and your Clan will have 23 hours to prepare for the battles ahead. During this time, you can make adjustments to the War Base layouts and donate and request troops. The Clan Castle in your War Base is different from the Clan Castle in your village, and must be filled with donated troops separately. The troops donated to a War Base will be used to defend it against all attacks during the War, so be sure to request troops that you feel will work well with defending your layout. You cannot use troops donated to your War Base for your own attacks, these you request from Clan mates in the Troop training screen. Changes you perform on your War Base during the Clan War will not affect your village outside of the war. This also means that any troops donated to your War Base will not be available in your regular village, and vice versa. When the 23 hours of Preparation day have passed, your Clan should be prepared and hungry for victory! Each participant can attack twice during Battle Day, but not the same opponent. Make each attack count! 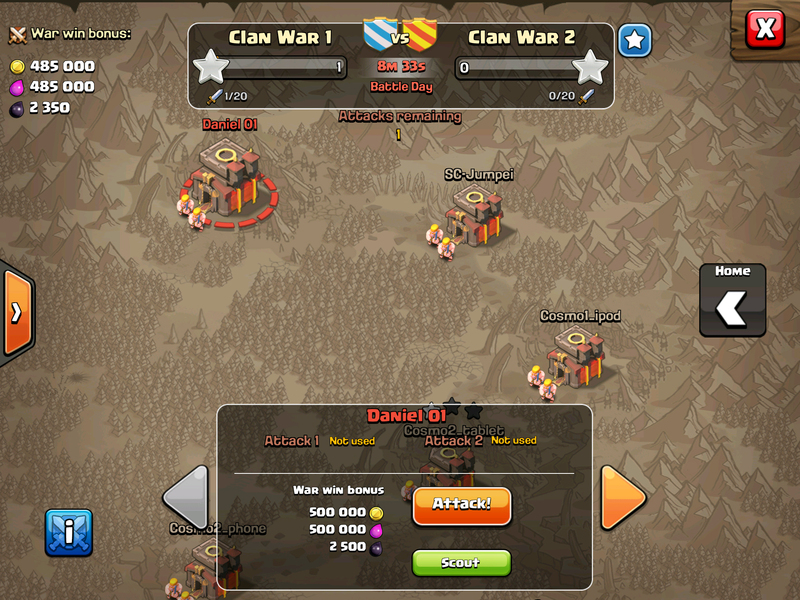 At the end of the war, the Clan that earns the most stars from attacking wins the clan war. If the amount of stars is tied, the destruction percentage is the deciding factor. 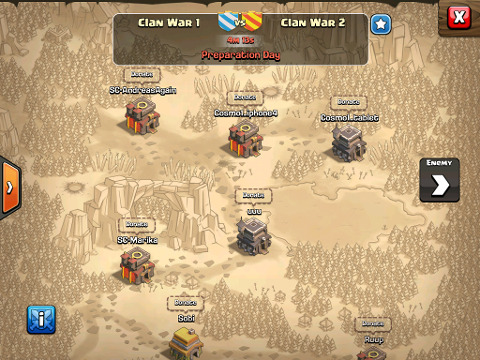 Clan Wars are free to start and participate in, and unlike normal multiplayer battles, Clans get to choose if and when they would like to go to war. Clans do not have to participate in Clan Wars. Friendly Wars have custom durations, so you can choose the war to last as short as one hour!